I stayed away from the Bella Center today, where the main climate change talks are taking place, and that seems to have been a wise decision. From now on, access to the negotiations for NGOs will be restricted more and more each day, shutting out almost everyone by Friday. 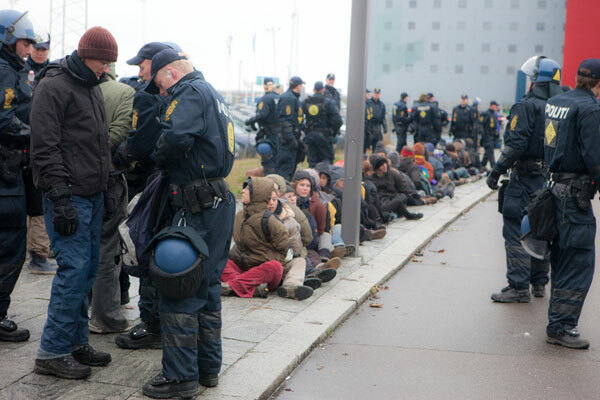 Today there were reports that even those with proper authorization could not get into the Bella Center, creating a feedback loop: the more people are denied access, the more frustrated they get, increasing the passion and size of the protests, making it harder for people to get in, making everyone more frustrated, etc. I spoke with someone who has been to all 15 COP meetings. He says nothing like this has ever happened before. Downtown I received reports that protesters were violently clashing with police, and I could hear and see helicopters hovering over the center seven kilometers away. By early afternoon sirens were sounding throughout the city core as well, and police started shutting down sections of streets and stores. A local woman named Anna Sophia told me that people who live in Copenhagen think of it as a small town. Now this town is growing up quickly. Aside from the frustrations around access, it’s also becoming clear that the national governments gathered here are not going to reach an agreement that satisfies the unflappable demands of our best science. The new buzzword to emerge, therefore, is “sub-national.” As in, regional and municipal governments all around the world are going to have to pick up the slack and get to work. Yesterday, California Governor Arnold Schwarzenegger (perhaps you’ve heard of him) called for formal talks between these “sub-national” governments, and offered his state as a venue. This morning, I attended a press conference where the premiers of Quebec, Nova Scotia and B.C. and the ministers of the environment from Ontario and Manitoba were congratulated by environmentalists on the leadership they’ve shown. In accepting the award, Jean Charest offered “reassurance” that by no means would they take this as a sign that everything they’re doing is great, nor are they under the impression that there isn’t a lot more work to be done. Still, it’s an encouraging start. That’s where I’m finding hope in these final days. When things fall apart and the central governments cannot hold to their responsibilities, more local governments can and will step in. At a Canadian reception this evening, I had a number of conversations with elected leaders and activists about the possibilities for Toronto to take a leadership position not only in Canada but on the international stage. Those conversations and ideas solidified my growing excitement about what the Toronto government could and should do to move our city into the future. Photo by kk+ from the Copenhagen Flickr pool. Since Google Transit launched in December 2005 it has been adding Canadian cities one at a time. That list has grown to include Hamilton, Ottawa, York Region, MontrÃ©al, Vancouver, Fredericton, and now, announced yesterday, Calgary. Canada’s largest city, Toronto, is conspicuously absent. That’s an embarrassment for the City and the TTC. Google Transit is a service that works with Google Maps to help people plan trips on public transit (instead of just by car, as the first version of Maps did). A visitor to the site enters their start and end points, and Google gives them step by step instructions for reaching their destination (walk to the corner, wait for the 5:00pm bus, transfer to the subway, etc). The system uses schedule data to know when you need to show up at each transfer point, and to estimate how long the total journey will take. Google reportedly provides this service to municipalities free of charge. All they ask is that those municipalities provide them with their transit schedule, stop and route data. Then Google does the rest of the work. For free. Back in March 2006, then TTC chair Howard Moscoe gave reporters the impression that Google Transit was coming “soon” to Toronto, but days later a report from Chief General Manager Richard C. Ducharme was seriously lacking in enthusiasm for partnering with Google, even while noting that going it alone would cost the City $2,000,000. In December 2006 I wrote TTC commissioners urging them to work with Google on transit routing, and suggesting (correctly, I think) that they’d be able to rapidly compile the data for Google using volunteers from Toronto’s enthusiastic transit and web development communities. Adam Giambrone’s office replied to let me know that they were “working on getting the TTC on Google Transit” and that “hopefully it will be up and running soon.” Interim Chief General Manager Gary Webster wrote to say that “the TTC considers the development of its information and communication resources to be a very important item” (try saying that three times fast) and that they had “participated…in some preliminary information gathering sessions with Google Transit project leaders.” Finally, he added that since “TTC staff are involved” he would “respectfully decline” volunteer help. At the time of that correspondence, there weren’t any other Canadian cities on Google Transit. Now there are seven. When Hamilton was added three months ago, the Hamilton Spectator asked how it was possible that Hamilton had beaten Toronto in the race to get on the service. The answer? The city of Hamilton was “very co-operative” in the partnership, a Google spokesperson said. Meanwhile, the TTC is still developing their own separate routing system (“Future home of Trip Planner,” ttc.ca currently declares in a randomly orphaned piece of text) which is off-schedule, costing us millions of dollars, and will arguably be redundant with the Google service (though at this point final judgment should be reserved until we can see both services in action). It didn’t have to be this way. The fact that Google Transit was going to become a great partner was easily predictable, as was the fact that the TTC would ultimately mismanage their own very expensive alternative trip planner. The only silver lining is that we’re now, finally, hopefully, only months away from being able to plan transit routes online. Traffic was restricted on Yonge St. south of St Clair Ave. this morning after the pavement sagged near a broken water main. Toronto police closed the road around 8 a.m. at Summerhill Ave., near the Summerhill subway station, to investigate the sagging asphalt. Toronto Water had been investigating the leak since yesterday afternoon. Police said water from the broken pipe left an open hole in the ground. Over the past few years, under the parties of the past, governments of all stripes have cut funding to municipalities while simultaneously downloading responsibilities. This morning’s incident is just one example of the sorry state of our city’s infrastructure, and the severe lack of long-term thinking displayed by our current political leadership. As a result, we’re now paying more to deal with incidents like this than we would have paid to invest in cities in the first place. (To get a sense of how much more, try and wrap your head around this report’s finding that one billion dollars’ worth of drinking water disappears into the ground every year in Ontario alone due to “rotting, leaky municipal water pipes.”) Meanwhile, our federal government sits on giant surpluses while telling Toronto to “drop dead,” in the words of a recent Star headline. It’s time for new ideas. It’s time for a party that takes long-term planning seriously. It’s time to invest in our communities and build the great city we know Toronto can be.